This Traditional style drop in tub includes a sloped backrest, integral arm rest and removable pillow. Other standard features include a textured floor, and premium reinforcement. 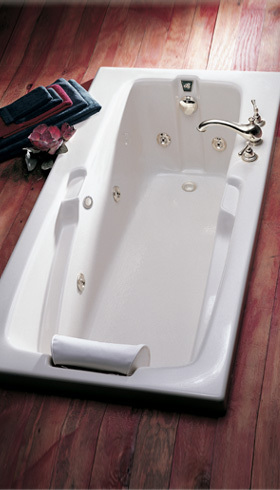 This tub is made in the USA and is available in 24 colors including marble. The Whirlpool jacuzzi includes: 2 hp pump, 3 speed control, 8 spa jets which are adjustable for water flow, air flow, mix and direction, color match jet trim for standard colors, 2 silent hydrotherapy air controls included, rigid PVC piping and leak-free rubber pressure gaskets. Air Tubs Include: 16 high output lateral air injectors, 2 HP variable speed blower/600 watt ceramic air heater, and an automatic purge cycle with timer for air system, Air tubs can safely use bath salts and aromatic oils. Combination jacuzzi tubs include everything listed above offering the ultimate spa bathing retreat in your own home. 59.75" x 31.875" x 21.5"